Sports are one of America’s favorite pastimes and families are seeking activities to foster this love of sports in their children. With activities such as Flag Football, Baseball, Basketball and Soccer on the rise, the demand for well-run programs continues to grow. Recently celebrating their 10th anniversary, i9 Sports remains the Nation’s first and fastest growing youth sports franchise. According to Frank Fiume, founder of i9 Sports, their steadfast growth is in direct correlation to this trend. “Families are seeking something better and something different for their children and i9 Sports fills this need. i9 Sports franchisees operate youth sports leagues that focus on fun, good sportsmanship, and safety. Here, they learn not only the basics of the sport, but the value of being part of a team without the sole focus on the outcome of the game. Another unique aspect of the i9 Sports program is how the business maintains a relationship with the parents and athletes across multiple sports. They offer a convenient, customer-focused, registration process that can either be completed online or via phone. Their proprietary technology makes administration and scheduling simple for i9 Sports franchisees and provides them the ability to easily communicate play time and practice schedules to families. Couple this with a robust website that gives parents an online portal to manage their child’s information and history and you’ve got a winning system designed with the customer in mind. Recently I spoke with Chris Novak who, along with his wife, owns and operates as an i9 Sports franchise in East Oakland County, Michigan. 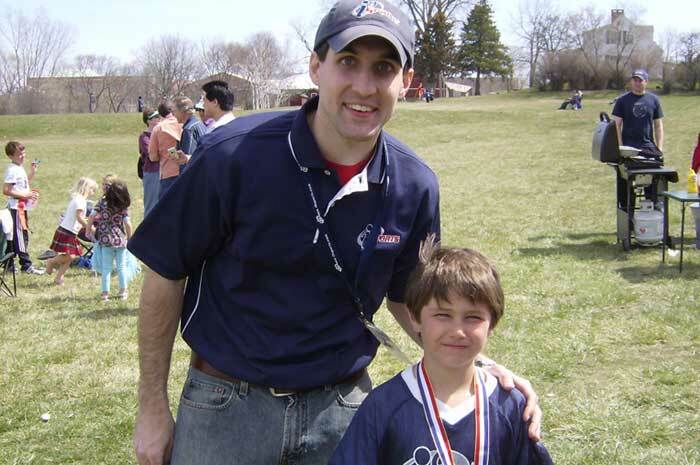 Matt Biskup: Thanks, Chris for taking the time to share your story with our readers. Chris Novak: No problem, Matt. I’m happy to talk about our i9 Sports franchise. MB: When did you first get the idea to open your own business? What line of work were you in prior? CN: I’m a CPA and was working as a financial analyst in the automotive industry. I started thinking about my future with my wife, considering children, and began to contemplate career options which would permit me to spend a little more time with my family. Owning a business started creeping into my thoughts. I considered consulting in the financial arena. Ultimately I discovered i9 Sports. I bought the franchise in 2008 and I ran my first league in 2009. MB: What factored into your decision to open a business with a franchise? CN: I wanted to take advantage of a system that already was developed, in which my financial background would be an asset. I knew that I could rely on my ability to see all the component parts of a business. I felt that I would also be able to determine the potential profitability at the outset and as the company grows. MB: Who or what helped you make the decision to become an entrepreneur with i9 Sports? CN: I liked how the upfront cost of opening an i9 Sports was lower than other businesses that I considered. One of the key differences with i9 Sports is how the business negotiates the use of sports facilities that already exist in the community as opposed to developing new sports facilities. From a personal standpoint, I’m one of 9 kids. I played a lot of rec sports and sports with my 6 brothers growing up. I’ve always been into sports. MB: You’re five years into your i9 Sports now and you’re not a single unit owner, you’re an area developer. What does a typical day look like for you now as an i9 Sports owner? How does that compare with your typical day before? CN: My role 4 years ago was very different. I was at the fields, not coaching, I’d pinch sub for a referee, and handle all the registrations and handle all of the financials. Now I administrate my coaches and interface with representatives of the venues. I do attend most season opening and ending days. Usually I’m not at the fields at all these days. MB: What does the growth plan look like for your i9 Sports? CN: Now that I’m an area developer, my 10 year plan has totally changed. We’re opening up volleyball this Fall. We’re already doing 6 sports. In 5 years, we likely will not be doing more sports, but more seasons of each sport. So sports all year round is the goal. MB: What have you learned so far in this endeavor that was the most surprising to you? CN: I learned that I must be ready for a rapid change of sales, growth, roles and duties that my team and I had to play. Especially since my “team” at the outset was me and my wife. Things got busier quickly. The growth increased the general responsibilities quickly. MB: What have you encountered that is the most scary for you? CN: 2.5 years in, I made the decision to hire our first full time employee. That was a big step. MB: What advice would you give to others who may share the same dream of entrepreneurship but haven’t “taken the plunge” yet? CN: Do your due diligence. See if the day to day operations matches your lifestyle. Doing lots more research will help you. If you do that, if you feel comfortable, do it. There won’t ever be a time where you’ll feel totally comfortable. The first two years, expect it to be tough.